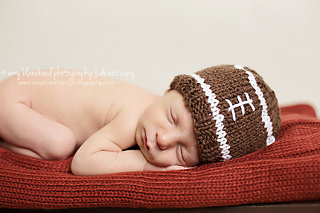 Perfect for football fans, this beanie fits growing baby heads while celebrating America’s favorite fall sport. Feel free to substitute any aran weight (10 ply, 8 wpi) yarn. Note: You will use between 40 and 80 yards of yarn total, with the majority being brown and just small remnants of white.